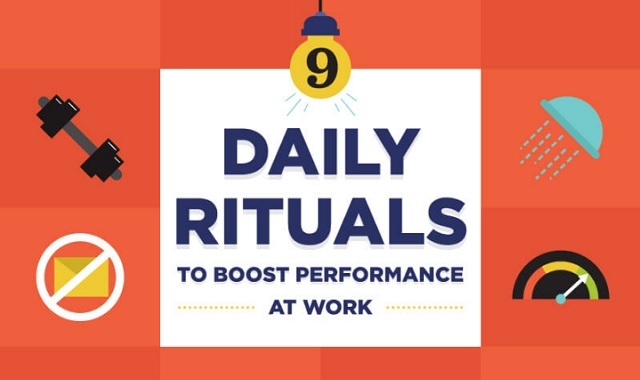 9 Daily Rituals To Boost Performance At Work #infographic ~ Visualistan '+g+"
If you’re looking to give your performance a boost, take a leaf out of Barack Obama or Oprah Winfrey’s books. The former president started each day in the White House by rising at 5 a.m to hit the gym, while Oprah begins her mornings with twenty minutes of meditation. From athletes to entrepreneurs. many successful people have one thing in common: a superstitious ritual. It might seem silly. but research suggests it's not all in their head. Take a look at these 9 rituals and give some of them a try. We’re sure it will help you be at your best when it really matters.